Investors involved in international trade face reputational and policy risks from increased publicity to the contention that free trade is harmful both to advanced and developing countries. An index of openness to trade correlates strongly with indicators of health, education, and personal security. The data suggest that quality of life gains are widely shared within countries, not concentrated on elites. Investors in import and export industries, supply chain management, and related financial activities face increased reputational risk from increased publicity given to the contention that free trade is harmful both to advanced economies and their trading partners in the developing world. In some cases, that may translate into policy risks, in view of the apparent openness of the new administration to views that are critical of trade. This post presents data suggesting that the harmful effects of trade have been overstated and the benefits understated. The horizontal axis on the chart represents an estimate of each country's "freedom to trade internationally" from the Fraser Institute's Economic Freedom Index. It scores each country on a scale of zero (least free) to ten (most free) according to indicators for tariffs, regulatory trade barriers, compliance costs for importing and exporting, black market exchange rates, controls of the movement of capital and people, restrictions on foreign ownership and foreign investment, capital controls, and freedom of travel. The vertical axis represents a combined score for health, education, and personal safety based on data from the Legatum Prosperity Index. The scores range from zero to 100. The scatterplot shows both scores for 144 countries. There is a clear tendency for people who live in countries that are more open to trade to be healthier, better educated, and more secure in their personal lives. The correlation between the two scores is a respectable 0.67, statistically significant at a 0.01 level of confidence. The blue diamonds in the scatterplot represent the 35 members of the OECD. Since a country has to be free and prosperous to receive an invitation to join, it is not surprising that these countries are grouped in the upper right-hand corner of the chart. That is no real surprise. 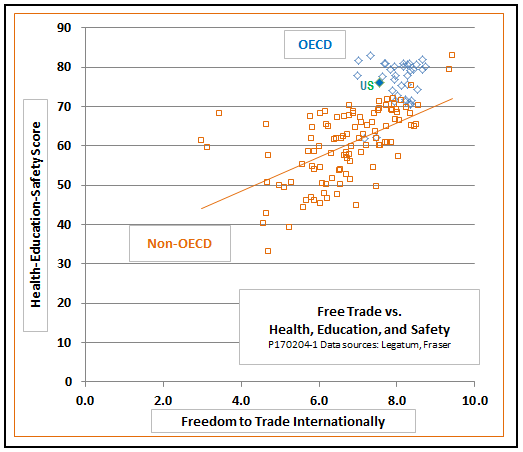 More interesting is the degree to which the positive relationship between trade and quality of life holds up for the developing countries represented by the orange squares. The correlation between the two scores for the non-OECD group is 0.57 - not quite as strong as for the 144 countries as a whole, but still statistically significant. (See additional analysis here). Critics of globalization might wonder if the positive relationship between trade and personal well-being in the cross-country data might mask inequalities within countries. That would be the case if trade primarily benefited elites - if it improved the lives of a few rich winners, while relegating poor losers to illness, illiteracy, and personal insecurity. The people who compiled the Legatum Prosperity Index were well aware of that possibility and took steps to ensure that countries could receive high scores only where social benefits were broadly shared. To that end, the Legatum education scores include measures of adult and youth literacy rate, education equality, primary school completion rate, secondary school enrollment, and the ratio of school enrollment for girls and boys. The health scores include access to basic sanitation, immunization rates, deaths from tuberculosis, and life expectancy at birth. The personal safety and security scores include measures of malnutrition, homelessness, deaths from civil and international conflicts, number of refugees, and safety of walking at night. The inclusion of such indicators would pull down the rating of any countries where only elites were healthy, well educated, and secure. I would caution that the correlations shown in the chart do not mean everyone in every country gains from trade, and that there are no losers. It is easy to find examples, say, of farmers in third-world countries whose livelihoods are threatened by imports from technologically advanced farms in high-income countries, or of communities in wealthy countries that feel severe hardship when a local factory moves production to a low-wage country. What the data do suggest, however, is that the gains from trade are broadly enough shared to pull up the country averages in both advanced and developing countries. Investors who want to mitigate reputational and policy risks arising from the anti-trade movement might consider expressing support for appropriate reforms. Reforms can be consistent with fully realizing mutual benefits from trade and ensuring they are as widely shared as possible. The governments of developing countries bear a large part of the responsibility for ensuring that is the case, but the governments and business communities in advanced economies can support local reform efforts in trading partners that are poor and badly governed. They can ensure that the norm is not just to comply with local labor and environment standards, but to aim higher than those local standards. Governments can insist that their own nationals do not corruptly conspire with local economic and political elites at the expense of the poor. And they can politely but firmly resist the suggestion of any of their own citizens that the best way to help people in developing countries is to refuse to buy anything from them.